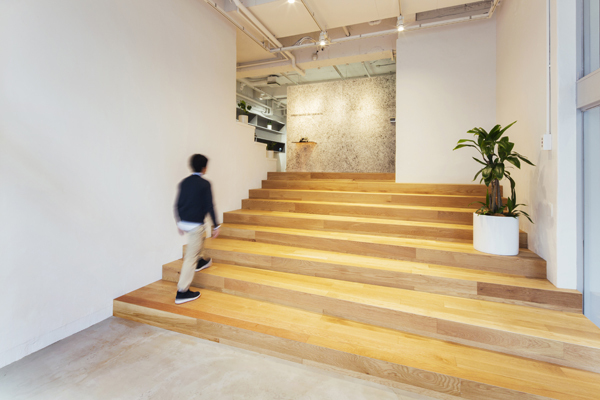 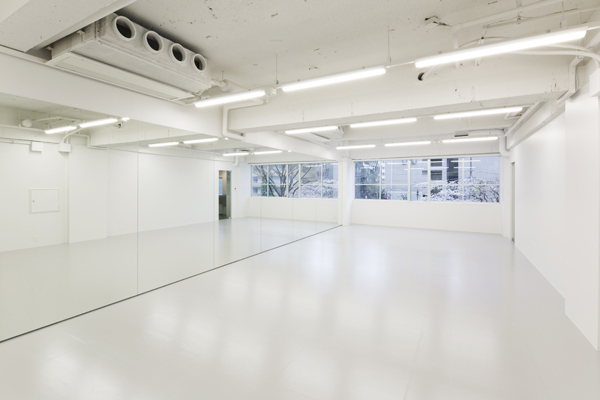 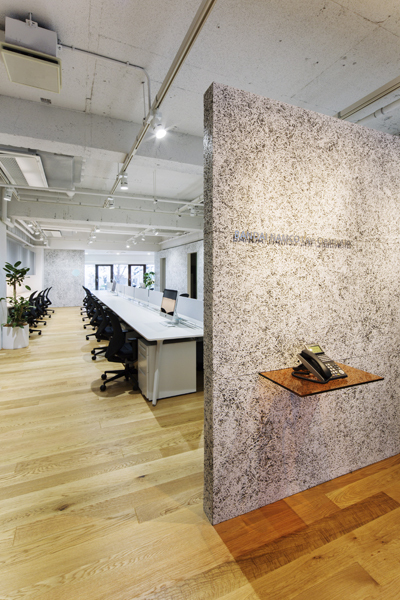 We designed the new offices of a one-stop concert and event production company in Shibuya, Tokyo. 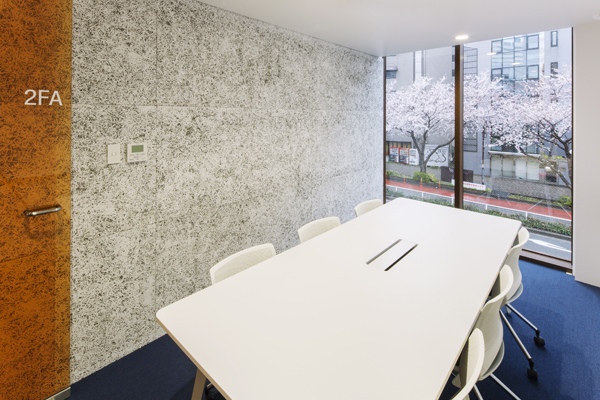 The project involved the renovation of a 45-year-old building located by the riverside of the Shibuya River with a view of a park. 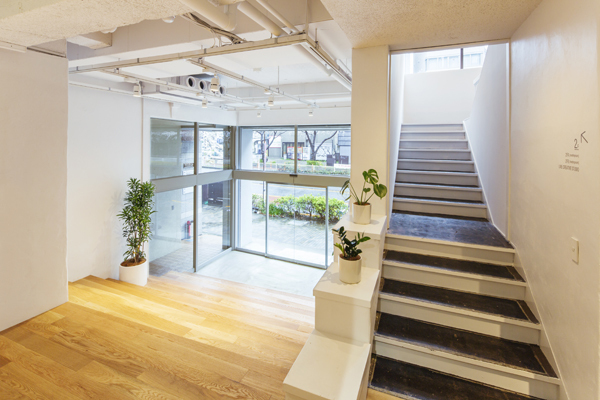 The 1st and 2nd floors of the building house the office components, such as an open work space, meeting rooms, etc., as well as a full-size dance studio. 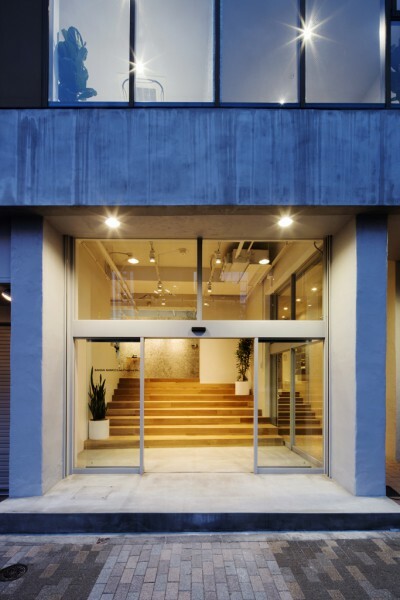 The linear spatial structure adopted for our design confers a sense of openness to the building, even allowing passersby to see the park from the street. 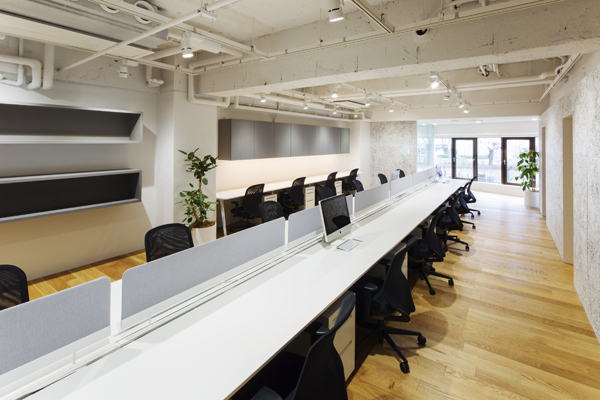 Long rows of desks accentuate the directionality of the work space located on the 1st floor, while various meeting rooms and a dance studio fitted with a mirror spanning the length of the wall can be found on the 2nd floor. 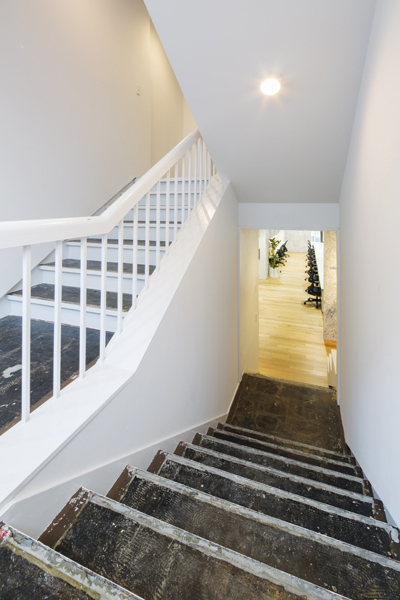 Moreover, the grand staircase found at the entrance takes advantage of the difference in height (1500mm) between the ground level and the1st floor and features stairs running at irregular angles relative to the street. 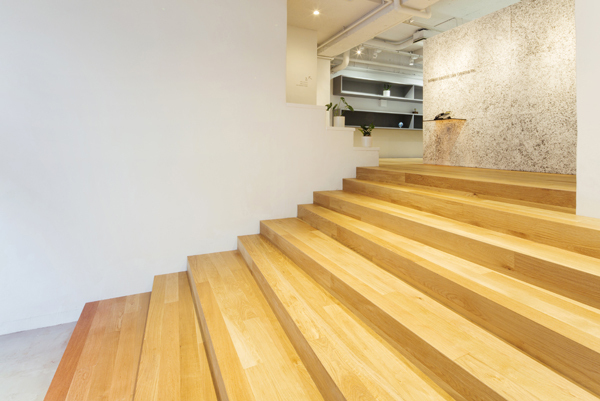 This grand staircase becomes the face of the office while guiding visitors to the upper floors in a smooth manner. 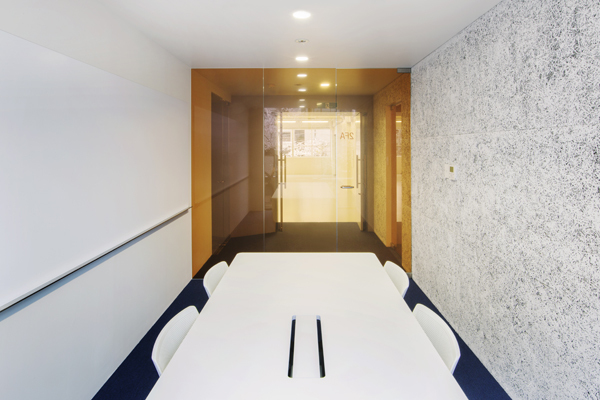 A paint finish was applied directly onto the skeleton framing of the ceiling while newly erected walls made of cemented excelsior boards were used to partition and accentuate each space in the office, such as the entrance, work space, meeting rooms, and office kitchen. 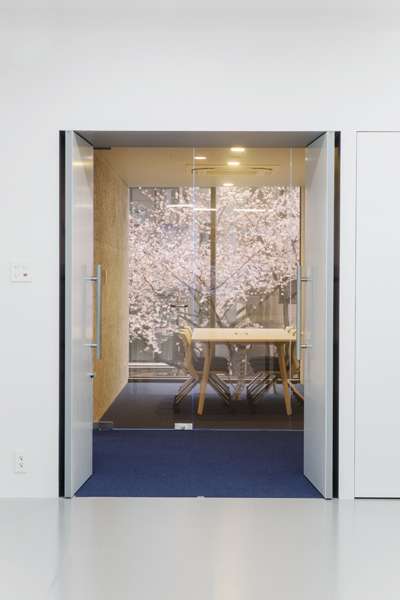 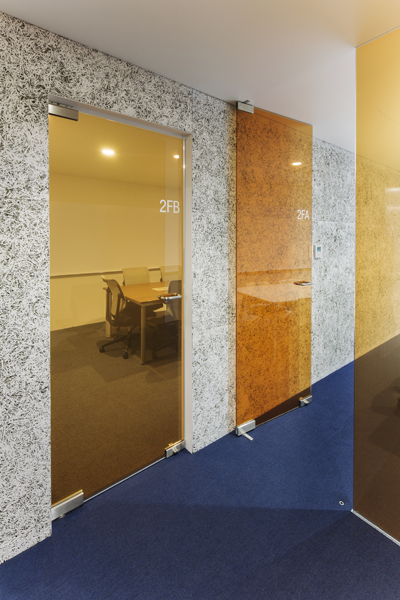 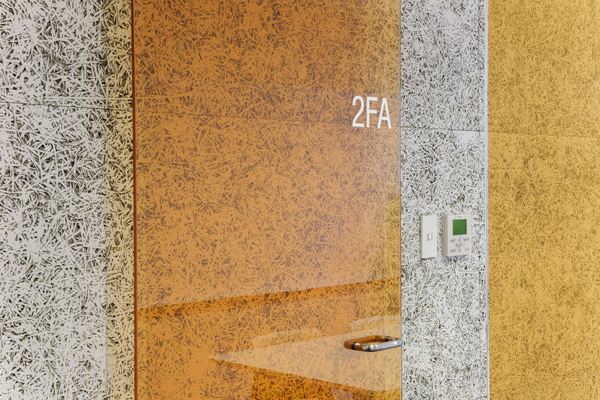 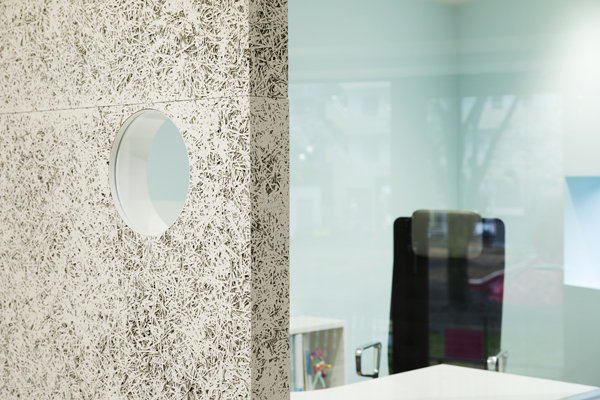 Similarly, colored glass panes found throughout the area and pastel colored surfaces visible from openings in the walls, along with the cherry blossoms in the park, which can be seen from the windows, all contribute to add a touch of color to the office. 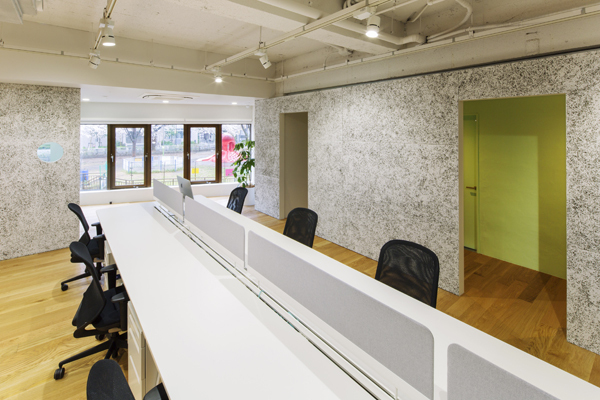 We sought to capitalize to the maximum extent possible on the characteristics of the existing building's frame as well as its surrounding environment while carefully adding reconfigured parts.